Do You Sometimes Wonder If Someone's Bugging You? Is there a tiny, concealed microphone somewhere in your life - hidden, perhaps, behind that abstract painting on the conference room wall? It may well be relaying those marginally funny warm-up jokes you usually tell at meetings to an unsmiling, even impatient, audience in a car parked just outside the plant. And then do those same uninvited guests hear, with considerably more interest, your plans for solving engineering design problems that could make or break the company next year? Why those plans in the right hands would be worth thousands! It's possible that your picture is bugged. Maybe someone did pay thousands - say two thousand - to bug your conference room. Maybe the bugger (you're the buggee) didn't plant the transmitter behind the picture. He could have replaced your electrical wall plug with one of his own that contained a transmitter. The wall plug would work normally - you wouldn't suspect anything - and the transmitter would operate on your electrical power. But then that's what industrial bugging is. Or maybe your telephone is bugged. That's more likely, more the way things are done nowadays. While microphones are still a definite part of the eavesdropping scene, telephones are more popular as vehicles for tuning in on other people's lives. With the telephone, the bugger and his client don't have to sit in a car down the street listening to a transmission that only travels a quarter of a mile and that might be intercepted by the buggee's own secretary searching for the ball game on her FM transistor radio. They can sit in an office anywhere within the direct dialing system of your telephone and tune in the entire room. Monday morning paranoia? Not at all. Industrial eavesdropping is booming, rising faster than any other category of illegal surveillance, according to the Chief Assistant District Attorney and head of the Rackets Bureau in Manhattan, New York City, Alfred J. Scotti. "Bugging has quadrupled since 1966 when bugging expert Manny Mittleman's transistorized olive-in-a-martini transmitter," says Robert M. Brown in a revised edition of his 1967 exposé, "The Electronic Invasion," scheduled to be published by the Hayden Book Co. early next year. No expert disagrees that bugging is on the rise. 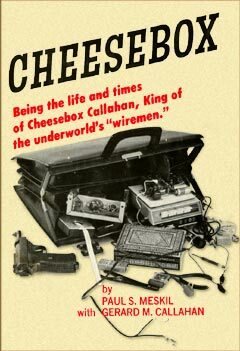 "There's more (bugging) going on today than there ever was, and it's for corporations, not for organized crime," says Gerard Michael "Cheesebox" Callahan, whose clients ran the gamut from Al Capone to Lucky Luciano and later to legitimate business. 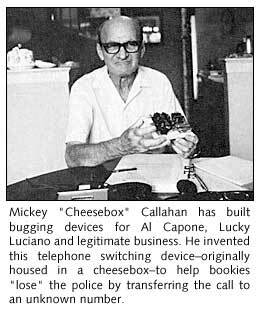 Callahan earned the name "Cheesebox" for an early invention, still flourishing under other names, that automatically transfers a call received by one telephone to another one miles away. But bugging is big, and Watergate has started people thinking about it again. "It has created a new awareness of bugging," Brown will say in his new book. "A lot of people now think they're under some kind of electronic surveillance and want to have their offices or homes swept. Debugging is now big business." The equipment and techniques used in Watergate, however, were a design disaster - an embarrassment to the bugging community. "An incredibly dumb job," says Gene Levette, one of the country's leading experts on bugging and debugging. Mickey Callahan gets very emotional when Watergate is brought up - the old fire horse syndrome. "If they'd only hired me to do it," he says sadly. "They didn't even have to break in. They should have tapped the wires downstairs in the bridge box or outside the building, put a tape recorder on it and that would have been it. They were a bunch of stupid.....s."